If you require any other information or help with a specific installation, please contact us. 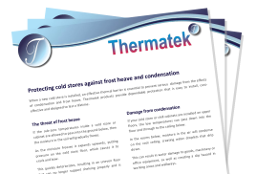 Thermatek® has been an innovator in frost heave and condensation protection for over 20 years. We create products of the highest quality, backed up by outstanding support. We are proud to be protecting some of the world’s most important establishments. © 2014-2018. Thermatek® is a registered trademark of Safeguard Electronic Systems Ltd.